“For all the amazing people out there who have struggled and not known why. This is for you”. It begins with very helpful notes for teachers regarding the different kinds of neurodiversity and also emphasises the strengths and talents that come with neurodiversity, as well as acknowledging the difficulties, many of which are exacerbated by other people’s reactions. 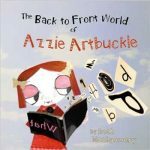 The illustrations are fun and there are only a few words to read, which is in keeping with Azzie’s own difficulties with reading, which make her feel like a failure despite her enormous talents in other areas. Getting a diagnosis of Dyslexia, however, enables Azzie to make sense of her struggles and it stopped others calling her stupid or accusing her of messing about. Thank you again for this great review, on behalf of the author and myself. I will endeavour to mention Irlen Syndrome in the future – it’s just knowing when to stop listing things in the small amount of space available at the front! Thank you for leaving a comment. We have now included all these books on our information sheets which we routinely hand out to clients who attend our service for assessment.